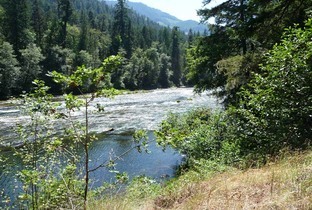 The Rogue River travels 215 miles from Crater Lake to Gold Beach where it pours into the Pacific Ocean. 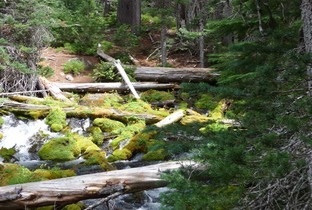 Rogue River starts from lava tubes located underneath Crater Lake. 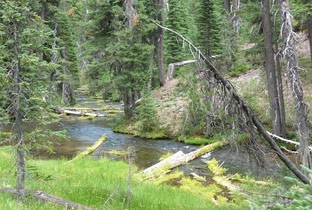 The birth of Rogue River (Boundary Springs) is located just north of Crater Lake. 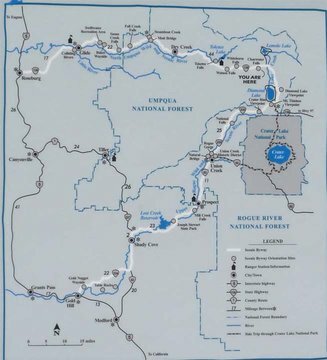 See map below to obtain an overall view of landmarks; Grants Pass, Lost Creek Lake, Union Creek, Crater Lake, Diamond Lake. Rogue River travels through many communities one such community is: Grants Pass. 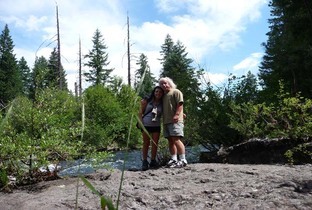 It is less than a 2 hour drive from Grants Pass to the start of Boundary Springs trail. 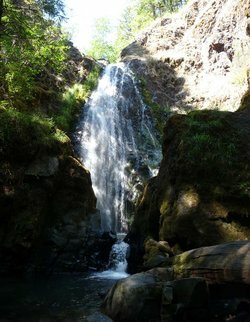 We enjoy staying at Morrison's Resort and we highly recommend it when visiting anywhere near Grants Pass. 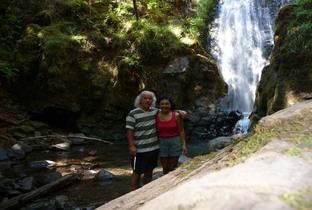 Frankie (one of several excellent river guides at Morrison's Lodge) told us about the Boundary Springs hiking trail. As you make your way from Grants Pass to Boundary Springs (the birth place of the Rogue River) on highway 62 you will pass by Lost Creek Lake (Rogue River flows into this lake). 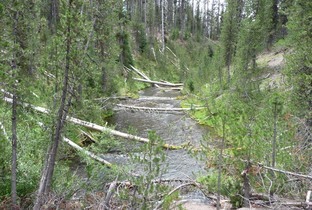 On highway 62 (just before you get to highway 230) you will pass by a small town Union Creek. 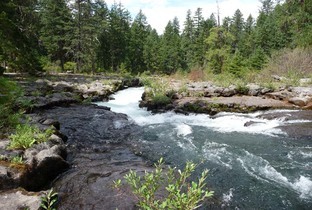 Union Creek is the first major viewpoint of the Rogue River that is easily seen from your car or just a few steps from the parking lot (see photo below). At this point be sure to take highway 230 if you continue driving on highway 62 you will go to Crater Lake. We once stayed in the rustic styled cabins in Union Creek. 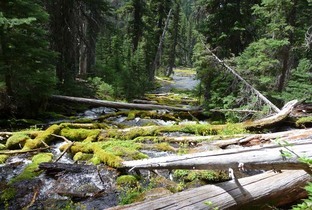 Approximately 19 miles north of Union Creek off highway 230 is Mt. Thielsen viewpoint. Around mile marker 19 at the Mt. 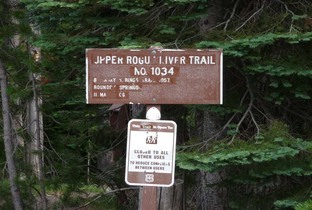 Thielsen viewpoint starts the upper Rogue River Boundary Springs Trail. Some brochures suggest the trail is a 5 mile round trip hike while other brochures suggest it is an 8 mile round trip hike. In either case it is a hike that is worth taking. As you get closer to the water gushing out of the earth you will come across a waterfall (see photo below). Once we reach the springs we filled up some water bottles with this clean, clear fresh water. The water is extremely cold. 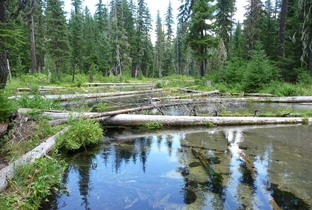 After the Boundary Springs hike you may want to continue sightseeing. 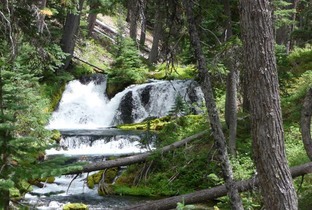 Approximately 5 miles north on highway 230 you will come across Diamond Lake and highway 138 (the Water Falls Highway). 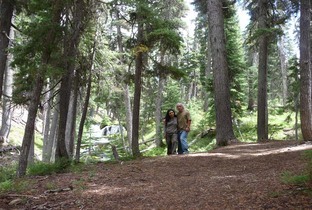 We once stayed at Diamond Lake Resort on a very cold June night. After exploring Diamond Lake take highway 138 heading west. 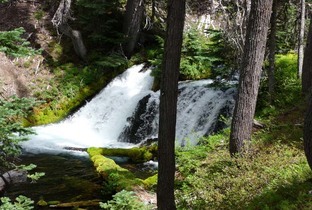 One of the first waterfalls you will come across on highway 138 is the Clearwater Falls (see photo below). There are many waterfalls, some require a short hike some a little longer hike. 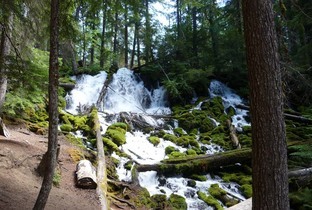 The Clearwater Falls is only a couple hundred feet from the parking lot. I would suggest downloading the Thundering Waters Guide for a very detailed map/guide to all the various waterfalls located in this region. As we have made our way through the Cascades we have at times stayed at Steamboat Inn. 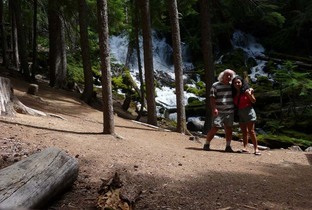 One of the last waterfalls is Susan Creek Falls. 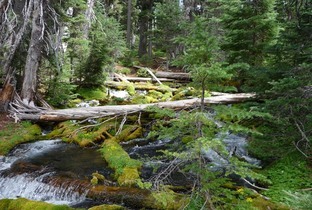 Susan Creek Fall is a 1.6 mile hike and is very enjoyable to go swimming in (see photo below). 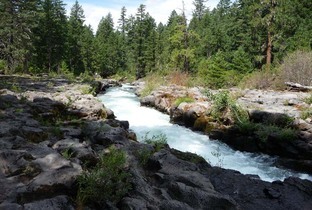 Some of these water falls are part of or flow into the Umpqua River (see photo below). Be sure to check out the Rogue River News Section with a rafting video.